" Canine lung cancer symptoms tend to be generalized, which means that they don't necessarily indicate the presence of cancer vs. other diseases. 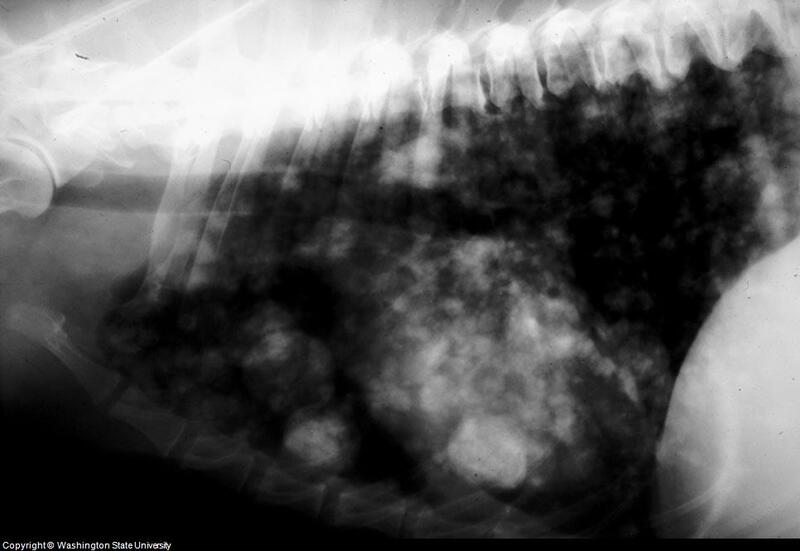 Lung cancer in dogs is either primary or secondary, and is mostly malignant (life threatening) in nature. Earlier stages of any type of it are usually asymptomatic. Even advanced stages of dog lung cancer exhibit highly non specific symptoms such as cough, anorexia (appetite loss), tiredness, weight loss etc. Incurable and persistent cough might help indicate the presence of the disease, but unfortunately, an affected dog does not show any signs of cancer until it metastasizes (spreads). Similarly, cough which produces blood represents an advanced stage of cancer. Lameness is another symptom exhibited if the lung cancer spreads to the brain and bones. Canine lung cancer symptoms therefore can never confirm that a dog has the disease. Awareness, immediate response to incurable symptoms and advanced testing techniques such as biopsy and radiography are some factors that can help in making a timely diagnosis and in identifying the right treatment plan. Other then specific treatment, surgery or use of chemotherapeutics, symptomatic and supportive components are highly recommended. Symptoms such as cough, anorexia and intolerance should be treated with specific drugs. Natural remedies may help to maintain cell strength. " The exhibition of canine lung cancer is highly dependent upon the pathogenesis (how the disease develops) of the condition. Initially, no symptoms are represented for several reasons; the most important of which is the respiratory capacity of the canine lungs. Canine lung cancer is either primary or secondary, which means the cancer either developed in the lungs (primary) or spread to the lungs from another part of the dog's body (secondary). In either case; it starts in very tiny part of the alveoli in the lungs. An affected dog will never feel any discomfort during the initial stages of the disease. Minor issues such as abnormal respiration may occur, but are either not noted or is at tolerable levels. In advanced stages, non productive or dry cough is initially noted with the progressive loss of appetite and weight. Cough remains incurable and does not respond to typical cough expectorants and cough depressants. In some cases, the dog lung cancer metastasizes (spreads) within the lungs and respiratory system where severe lesions are noted, represented by a cough which also produces blood. 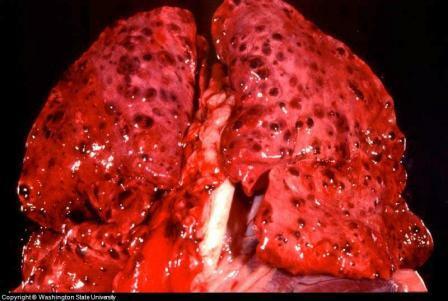 Canine lung cancer can spread to other parts of the body, especially to adjoining lymph nodes, the brain and the bones. This represents a highly advanced stage of cancer and is represented by canine lung cancer symptoms such as lameness and a severe lack of coordination, respiratory distress and/or circulatory collapse. Unfortunately, it is never possible that dog lung cancer symptoms can help in making a confirmatory or final diagnosis. In fact, symptoms associated with lung cancer are highly non specific meaning they can indicate several different diseases. Thus it is highly recommended that even minor issues of the dog respiratory system, especially which do not resolve on even first attempt at home treatment should lead to a consultation with a veterinarian. It is estimated that the occurrence of canine lung cancer has significantly increased over time, especially in last 20 years and is more common in dogs with age 8 – 12 years. Even then, in most cases it is confirmed in dogs 12 years of age or older. This demonstrates that the rate of ignorance to respiratory symptoms is relatively higher in younger dogs. Detailed clinical examinations and if required laboratory procedures such as a pathological biopsy and radiography should be carried out. Screening tests should be carried out at least once a year. If primary cancerous tissues are not eliminated, symptoms can never vanish with the use of drugs and agents. Surgical elimination of the cancerous tissue and chemotherapy can never be termed a solely curable approach, but it can increase the life span of a diseased dog from 15 – 26 months. In case of metastasis, where the cancer has spread, the life span shortens. Symptomatic and supportive treatment of canine lung cancer is vital; it not only supports the physiology of the respiratory system, but also helps in hastening recovery after surgery and the use of chemotherapeutics, which have a severe effect on the body. Treatment of symptoms such as cough, anorexia and intolerance are effective only once specific a treatment plan is applied, and done with specific drugs such as cough expectorants, vitamins, minerals etc. Natural remedies such as C-Caps Formula on the other hand can help to maintain the strength of affected tissues and should be used during as well as after specific treatment options are applied Moreover, natural remedies can help to improve the life quality of incurable dogs that are suffering from canine lung cancer symptoms.